Western blot analysis of extracts from HeLa cells, transfected with 100 nM SignalSilence® Control siRNA (Unconjugated) #6568 (-), SignalSilence® Dicer siRNA I #6576 (+) or SignalSilence® Dicer siRNA II (+), using Dicer Antibody #3363 and α-Tubulin (11H10) Rabbit mAb #2125. 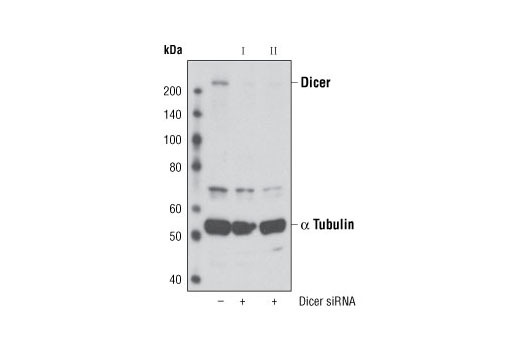 The dicer antibody confirms silencing of dicer expression, while α-Tubulin (11H10) Rabbit mAb is used to control for loading and specificity of dicer siRNA. CST recommends transfection with 100 nM Dicer siRNA II 48 to 72 hours prior to cell lysis. For transfection procedure, follow protocol provided by the transfection reagent manufacturer. Please feel free to contact CST with any questions on use. SignalSilence® Dicer siRNA II from Cell Signaling Technology (CST) allows the researcher to specifically inhibit dicer expression using RNA interference, a method whereby gene expression can be selectively silenced through the delivery of double stranded RNA molecules into the cell. All SignalSilence® siRNA products from CST are rigorously tested in-house and have been shown to reduce target protein expression by western analysis. Dicer is a member of the RNase III family that specifically cleaves double-stranded RNAs to generate microRNAs (miRNAs) (1). After long primary transcript pri-miRNAs are processed to stem-looped pre-miRNAs by Drosha (2), pre-miRNAs are transported to the cytoplasm and further processed by Dicer to produce 22-nucleotide mature miRNAs (3). The mature miRNA then becomes a part of the RNA-Induced Silencing Complex (RISC) and can bind to the 3' UTR of the target mRNA (3).